Neil Diamond's remake of the 1927 Jolson vehicle isn't very good, but neither is it the vacuous, sentimental ego trip it's been painted as. The Jolson version was centered on the myth of the melting pot – the hero escaped his ethnicity and became something new, an “American." Here, the theme is more personal and psychological: Diamond must find a way to escape his father without renouncing his Jewishness. Nothing is followed through with much rigor, and the resolution is artificial, but the film at least has its teeth into something real. The year was 1980. The United States, befitting its Cold War Superpower position, boycotted the Summer Olympics. Mount St. Helens erupted and besieged the West Coast with ash and volcanic debris. Congress passed the Refugee Act of March 17, 1980, providing the “first permanent and systematic procedure for the admission and effective resettlement of refugees of special humanitarian concern to the United States." News giant CNN was born. The Iran hostage crisis was in full swing, and the political landscape of the country shifted to the right with the election of actor-turned-politician Ronald Reagan. And, as the United States teetered on the brink of conservatism, supply-side economics, stagflation, deficit spending, severe cutbacks on social programs, anti-affirmative action initiatives, and increased INS enforcement at its borders, Neil Diamond's remake of The Jazz Singer was released. Described by critics as “empty-headed," “ill-begotten," “unbelievable," and “forgettable," this 1980 version of the now canonical story of generational tension, Jewish identity, and father-son conflict bombed at the box office. The story, according to critic Paul Brenner, had become, by 1980, a tired, hackneyed, “moth-eaten" narrative, and other critics voiced their desires that this would be the final remake of The Jazz Singer. In the face of such lackluster and harsh film reviews, the soundtrack for the film sold five million copies and produced three hit singles, including “America ," which quickly became an patriotic anthem that espoused an unproblematic, essentialized immigrant experience. It was the featured song at both the 1986 Statue of Liberty Centennial celebration and 1987's Welcome Home Gala for Vietnam Veterans. It was also the campaign song for 1988 Democratic presidential hopeful Michael Dukakis, a self-proclaimed, second-generation “child of immigrants." The film's reception at the box office – universally considered “dismal" both critically and financially – certainly did not match the soundtrack's success. Moreover, the persistence of the song “America " in political and nationalistic discourses, along with the success of other hit songs (“Love on the Rocks," “Hello, Again") in the realm of American popular culture illustrates the fact that, among the buying public, the album was well received. Neil Diamond's career did not suffer as a result of this box office failure – on the contrary, his popularity as a spokesperson for a particular type of immigrant experience and American identity construction seems to have flourished as a result of this film and its most famous track, “America ." Why is there this seemingly incongruous disjuncture between the reception of the film and the reception of its soundtrack? 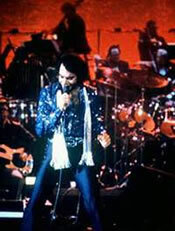 One could certainly make the claim that Neil Diamond is much better received as a singer/songwriter than as an actor – several critics have remarked that Diamond, in the title role, seemed wooden and unconvincing, and that the film's highlights mostly involve Diamond's singing performances. Though Diamond shared the screen with acting luminary Laurence Olivier and experienced performer Lucie Arnaz, the film still suffered from bad acting. Olivier, in particular, was criticized for his characterization of the “old world father" – according to writer Joe Queenan, Olivier was so offensive with his accent that his performance could be considered an inadvertent act of anti-Semitism. Moreover, the film's story - the subject of two other remakes (a 1953 version bearing the same title with Danny Thomas in the title role and a 1959 television remake starring Jerry Lewis) - had, by 1980, become an overly familiar cinematic trope. The specter of the original, often the point of critical and artistic departure for most remakes, haunted this particular version, and one could argue that the soundtrack succeeded because Neil Diamond, the singer/songwriter, was much better respected and more established in the realm of music and popular culture. It is the specter of the original that will serve as one of the primary foundations for my consideration of the 1980 Neil Diamond version of The Jazz Singer. More specifically, in juxtaposing the two versions, I will illustrate the ways in which the latter version represents a complicated, pivotal moment in a larger, dominant immigrant narrative of identity construction. The thematic focus of 1980's The Jazz Singer is, as David Kehr asserts, more personal and psychological in scope than the 1927 original, and the generational conflict depicted marks a significant departure from an assimilationist desire to become “American." In the original Jazz Singer, Jewish identity, a motif and one of the primary sources of tension between father and son, is shed by the end of the film. To the world, the protagonist has become a Jazz singer, a figure in blackface, an American iconographic symbol. Jakie Rabinowitz has become Jack Robin. Most importantly, by shedding this identity, the protagonist has successfully assimilated into the dominant fabric of American life and entertainment. In the 1980 version, Jewish identity is presented as an integral and undeniable aspect of the protagonist's identity, and the film's narrative attempts to develop a multicultural sphere in which the protagonist can be both Jewish and American. Though the protagonist does change his name (from Yussel Rabinowitz to Jess Robin), this name change is only superficial in scope. The film is filled with allusions to his Jewishness, and, in the final scene of the film, the protagonist's connection with his immigrant past is re-enforced by the performance of the song, “America ." Thus, the identity of “American-ness" revealed in the original becomes, in this last film remake, identities of “American-ness." This is not to say that the 1980 version, as a whole, represents a highly complicated or complete reading of ethnicity or Jewish American identity, but there are definitely elements present in the film which attempt to address the complexity of second- and third-generation immigrant experience. To dismiss this particular film version as merely “bad" does not address the significance of this film as a part of a specific cultural immigrant imaginary that is informed by the discourse of the ethnic revival of the late 1960s and 1970s. Additionally, the 1980 version of The Jazz Singer both imitates and departs from the 1927 original, and mapping the similarities and divergences allows for a more complete and nuanced consideration of the problem of identity in second- and third-generation immigrant narratives. The ways in which Jewish American identity is mediated through the realm of popular music is a major source of departure for the 1980 version, yet it is by no means the only point of disjuncture with the original. It must be noted that the 1927 version also uses popular music (jazz), but the means through which Jewish identity is mediated and resolved through the genre are markedly different in both scope and presentation from the 1980 remake. The revelation of cultural ethnicity, and the internal machinations involved in creating an ethnic identity, mark significant thematic and narrative differences between the two versions. Such differences reveal the ways in which the immigrant narrative has shifted from one of “melting pot" assimilation in the case of the former to a story of multicuturalism in the case of the latter. Finally, I will use Herbert J. Gans' notion of “symbolic ethnicity" to further emphasize the significance of the 1980 film in the discourse of immigrant narratives. According to Gans, symbolic ethnicity is characterized by a “nostalgic allegiance to the culture of the immigrant generation," and certain symbols of ethnicity (e.g. food, religious ceremonies, rites of passage) serve as signifiers of a seemingly increasingly elusive immigrant past. Gans asserts that such symbols “must be visible and clear in meaning to large numbers of third-generation ethnics, and they must be easily expressed and felt, without requiring undue interference on other aspects of life." Such symbols are present in the 1980 version of The Jazz Singer, codifying Jewishness and Jewish tradition for the viewer. On another level, this “third-generation" remake utilizes tropes of “symbolic ethnicity" to further solidify its stance as an “authentic" immigrant narrative embedded in a particular Jewish social and cultural construction. Before I proceed with my argument, I must make mention of other remakes that will not be considered in the course of this paper. Though the 1953 Danny Thomas remake of The Jazz Singer does bear mention in this discussion of remakes, I have chosen not to focus on this particular version because of its setting; moreover, the socioeconomic class of the protagonist does not match up with the original. In the 1953 version, the setting has shifted from a Lower East Side New York neighborhood to an upper-class district in Philadelphia, creating a remarkably different socioeconomic immigrant narrative. On another level, Danny Thomas, a non-Jewish performer in “real life," creates an uncomfortable space for comparison – Al Jolson and Neil Diamond, both Jewish performers, were able to manipulate the story to reflect their own respective histories. Diamond, in particular, pushed for key plot lines that reflected his own rise to stardom and his own experiences as an early singer/songwriter. There is another version of the story that I will not consider within the structure of my argument - the 1959 made-for-television version of The Jazz Singer with Jerry Lewis. Because it occurs in a different medium (television), and my argument centers on cinematic representations of the narrative, incorporating an analysis of this version would not be appropriate. Though both works are definitely interesting pieces worthy of consideration, their respective connections to the 1927 original are a bit tenuous in comparison to the Neil Diamond version. According to Krin Gabbard, in his essay “The Ethnic Oedipus: The Jazz Singer and Its Remakes,"
Apart from its initial popularity, The Jazz Singer (1927) ought to have held little appeal for remakers: the novelty of introducing talking and singing to a mass audience must have worn off rather quickly; changingracial attitudes ought to have made a narrative involving blackface obsolete if not off limits; the title's reference to jazz should have discouraged studio bosses once jazz ceased to be a popular music in the 1950s; the emergence of the state of Israel in 1948 drastically altered the issues of Jewish assimilation that are crucial to the film's plot…and the personality of Al Jolson weighs so heavily upon the 1927 film that any re-creation would seem to be impossible without him. Gabbard's consideration of the original is definitely illuminating; it is certainly important to remember the historical and cultural moment of the original Jazz Singer, for it provides a necessary context for the reception, by critics and the general public, of its story. Often touted as the first “talkie," the 1927 version still continues the conventions of the silent film genre – title cards are still used to relay most of the dialogue and set the scene, and the only moments of speech and sound occur during Jolson's singing numbers. The novelty of the film, technically speaking, was certainly a major draw (though it was not, in actuality, the first “talkie" produced) and the appearance of jazz, a popular music form at the time of the film's release, would have helped in box office sales. I shall never forget the first five minutes of Jolson – his velocity, the amazing fluidity with which he shifted from a tremendous absorption in his audience to a tremendous absorption in his song…. I turned to the girl beside me, dazed with memories of my childhood on the East Side… “My god, this isn't a jazz singer. This is a cantor!" Like the protagonist of The Day of Atonement, Jolson had become a blackface performer against the wishes of his cantor father. Jolson also saw the parallels between The Day of Atonement and his own life, and pushed for the film adaptation during the mid-1920s. Though not originally cast as the lead in the film adaptation (George Jessel, a vaudeville performer and up-and-coming dramatic actor, was given the role of Jakie Rabinowitz), Jolson was eventually given the role, and the rest, to use a cliché, is cinematic history. Though Gabbard contextualizes the original Jazz Singer in terms of its cultural and technological characteristics, he doesn't historically place the film. More specifically, Gabbard doesn't make mention of a significant act of immigration legislation (the Johnson-Reed Act of 1924) in his consideration of the reception and popularity of the original. I would argue that the Johnson-Reed Act had an incredible impact on both the film's reception and its narrative structure. The Johnson-Reed Act of 1924, a piece of legislation that enacted severe immigration restrictions, created a quota system based on 2 percent of each immigrant group's population according to the 1890 census. Such a quota was originally presented in a Report of the Eugenics Committee of the United States Committee on Selective Immigration, an organization that included Congressman Albert Johnson of Washington (president of the Eugenic Research Association, 1923 – 1924). This committee argued that such a formula, as quoted in Michael Frye Jacobson's Whiteness of a Different Color, “would change the character of immigration, and hence…[the] future population, by bringing about a preponderance of immigration of the stock which originally settled this country." For example, immigration from Russia would be reduced from 16,270 persons to 1,792 persons under the Johnson-Reed Act. Russia was, at the turn of the century, the country of origin for several thousand Jewish immigrants, and such a reduction impacted Jewish immigration and immigrant numbers. On another level, the Johnson-Reed Act also designated the Asia-Pacific triangle of countries as “undesirable" places of origin for would-be immigrants, and this classification would continue to affect immigration until the passage of the 1965 Immigration and Nationality Act. Asian immigration, which had already been greatly reduced by the 1882 Chinese Exclusion Act, was practically non-existent until the mid-1960s. Henceforth, after 1924, the immigrant to the United States was to be looked upon, not as a source of cheap or competitive labor, nor one seeking asylum from foreign oppression, nor as a migrant hunting a less strenuous life, but as a parent of future-born American citizens. This meant that the hereditary stuff out of which future immigrants were made would have to be compatible racially with American ideals. One of the motivating factors behind the construction and passage of the Johnson-Reed Act of 1924 seems to center on an anxiety about the “assimilability" and “othered" racial status of certain immigrants. The foci of both Laughlin's reflection and the Eugenics Committee of the United States Committee on Selective Immigration turns on the question of “future generations" and the ability for some immigrant groups (from Northern and Western Europe, for example) to assimilate within a “melting pot" demographic construction. Given the historical and legislative circumstances, the push to prove that a group could assimilate would make for a compelling and possibly empowering immigrant narrative. In this light, the 1927 version of The Jazz Singer, with its thematic focus of assimilation, is a product of its times. Simultaneously, with fewer and fewer Jewish immigrants allowed in the country, the opening scenes of the film, a bustling Lower East Side scene filled with newly arrived immigrants and second-generation children, create a nostalgic immigrant space. As the opening scenes unfold, the viewer is aware that this is a scene that will not longer take place as a result of the increased immigration restrictions. This sense of a historical past is emphasized by the narrative structure of the film, which takes place when the protagonist (Jakie Rabinowitz) is thirteen years old. Though no exact dates are given, the age of the protagonist serves as a reminder of the passage of time; the viewer meets Jakie when he is thirteen, and fifteen years elapse between this initial meeting and the reunion with his family in 1927. These opening scenes occur in the first decade of the twentieth century (1912-1913), and the scenes of “The New York Ghetto – throbbing to that rhythm of music which is older than civilization" occur before the passage of the Johnson-Reed Act. Thus, this cinematic depiction and immigrant narrative of a not-so-distant past in which “old world" traditions collide are deliberately placed at a time in which Jewish immigration, primarily from Eastern Europe and Russia , is still taking place. A closer reading of the film illustrates the ways in which the generational conflict between father and son becomes, as the narrative progresses, emblematic of an “intra-generational" tension between the views of “the old world" immigrants and the assimilationist impulses of the American-born, second-generation. Throughout the film, father and son clash over issues of tradition – the father is introduced to the viewer as “Cantor Rabinowitz, chanter of hymns in the synagogue" a figure who “stubbornly held to the ancient traditions of his race." The protagonist's father, along with other members of the “old world" community, inform the viewer (and Jakie) that “For five generations, a Rabinowitz has been a Cantor." Jakie's break with tradition, and his emergence as a jazz singer in blackface, serves a double role within this generational construction. The “five generations" mentioned throughout the film do not include the “sixth generation" – Jakie – who is a second-generation Jewish American. As Jakie tell his father, “You're of the old world! If you were born here, you'd feel the same as I do…tradition is all right, but this is another day! I will live my life as I see fit!" The distinction Jakie makes between the “old world" of his father and his present identity condition as a second-generation American living in “another day" is significant because it represents a breaking with tradition couched in the ideology of assimilation and a “new tradition," “new world" American-ness. Thus, Jakie's refusal to be a Cantor is also a refusal to participate in a Jewish familial, religious and historical tradition. The rejection of Jakie enacted by his father, the embodiment of “the old world," is two-sided in scope, rooted in Jakie's initial refusal to participate in the traditions of his ethnic heritage and his immigrant past. Though the protagonist does think of his family while on the West Coast (such reflections are revealed through montages of his mother and father), those around him (namely his shiksa love interest, Mary) are unaware of his conflicted familial background. In fact, when Jakie is asked to sing “Kol Nidre" in the place of his sick father, Mary and the director of the show do not seem to realize the importance of this request; instead, they urge Jakie to think of the show and his secular career. Jakie's performance of “Kol Nidre," which coincides with his father's passing, allows the protagonist to deal simultaneously with his immigrant past and resolve the intergenerational conflict with his father. With the passing of his father, Jakie is able to fully embrace his new American identity; his father, a constant reminder of the “old world," has, by the film's conclusion, forgiven and accepted his son. At the same time, Jakie's final performance in the film – as Jack Robin, a jazz singer in blackface – showcases his singing of “My Mammy," a decidedly non-Jewish song couched in the tradition of the minstrel show. Though his mother is in the audience, Jakie's connection to the immigrant generation of his parents is effectively broken in this space. The audience is unable to determine his “real" identity and ethnicity as a result of the medium through which he performs and the costume he brings to the stage. Prior to this scene, Jakie's mother, who has always been sympathetic to her son's desire to sing jazz, remarks, “He [Jakie] belongs to them now." In making this comment, Jakie's mother emphasizes and reaffirms his connection to another group, theater audiences and those involved in the theater business, outside the boundaries of the Lower East Side neighborhood. He has assimilated, on stage at least, into the fabric of American life, a racialized performer with a superficially marked identity. He has, in this final scene, successfully joined the “melting pot" entertainment realm. The historical context for the 1980 version is markedly different. In regards to immigration history, the film's setting occurs after the passage of the 1965 Immigration and Nationality Act. This piece of legislation opened up immigration into the United States by eliminating the designation of “undesirable" from the Asia-Pacific Triangle and abolishing the national origins quota system in favor of a “worldwide quota blind to national origin." The impact this immigration legislation had on the American demographic landscape was incredible in scope; thousands of South Asian, Southeast Asian, Dominican, and others from countries with predominantly non-white populations immigrated to the United States . This new demographic landscape is revealed in the first scenes of the 1980 Jazz Singer . The opening lines of the song, “ America ," serve as the primary verbal narrative in this initial scene, which, like the original, takes place in a Lower East Side New York neighborhood. The groups depicted, however, are remarkably different from those in the original; the opening shot is filled with Asian immigrants and Asian Americans, Haitian immigrants and Haitian Americans, African Americans, and Jewish Americans. Shop signs are in a variety of languages, and the American flag (which was also shown in the 1927 version) is placed alongside other national flags. The song hearkens back to a romantic notion of an immigrant's journey. Diamond sings, “On the boats and on the planes/ They're coming to America / Never looking back again / They're coming to America ." The lyrics are quite audible in this opening scene, and the juxtaposition of the song (which incorporates tropes of immigration) with the setting further reaffirms the status of those depicted as newly arrived or second-generation Americans. The incorporation of the words of “My Country ‘Tis of Thee" within the song's framework serves as foundation of American-ness and American patriotism. In comparison, the opening scenes of the 1927 version also utilize music, yet this music is instrumental and is much more traditional, and classical, in scope. inflected the meaning of ethnic particularism in two ways. First, it introduced a new idiom of group identity and group rights on the American scene – or more properly, it granted legitimacy to the invigorated, group-based resistance to an older, long-standing idiom of group privilege. Couched in the language of “ethnic particularism," the manifestations of the ethnic revival can be seen in the emergence of texts written by writers from traditionally subordinated groups in American life. On another level, this revival enacted, in both academic discourse and within the cultural imaginary, an impulse to “look back" to first-generation immigrant narratives, and the ways in which the “world of our fathers" was constructed. Such considerations are very much present in the 1980 version of The Jazz Singer , and the inclusion of “symbols of ethnicity" (in particular Jewish ethnicity) within the narrative framework of the film could be attributed to this new cultural and academic atmosphere. At this point, it is important to point out that this 1980 version of The Jazz Singer is a narrative of second-generation experience; Yussel Rabinowitch (shortened to Jess in the film) is a second-generation son of Russian Jewish immigrants. In a similar vein to Al Jolson, Neil Diamond's personal history also reflects this status, and the film is very much a Hollywood “biopic." However, I would argue that this second-generation narrative is subverted and manipulated so that it reads as a third-generation narrative. More specifically, the inclusion of certain ethnic symbols makes this film, according to Gans' definition, a third-generation product. For example, in a scene written for comedic effect, the shiksa figure in the film, Molly (played by Lucie Arnaz), bakes a ham for dinner. Jess throws up his hands, smirks, and the scene ends in laughter. The audience is included in the joke – the prohibition of pork in the Jewish culinary diet provides the basis for humor in this particular scene. Other instances of Jewish tradition are revealed, though not all moments are comedic. The audience is shown symbolic ethnic moments of Jewishness – a Chanakah celebration, a bar mitzvah – and not much commentary is given to explain these traditions to the viewer. Because of the function of “symbolic ethnicity," such moments serve as affirmations of the ethnic background of the protagonist. Most significant, the explanations of these events are unnecessary and not given in a third-generation narrative sphere. Ironically, this third-generation remake of the original utilizes third-generation “symbolic ethnic" moments that are known outside of the ethnic group. Continuing with Gans' third-generation definition of “symbolic ethnicity," Jess' status as a Cantor's son, along with his religious and ethnic affiliation, rarely impacts his “everyday" life as a singer/songwriter. In this version, Jess is an assistant Cantor, and the relationship he shares with his father is, for the most part, amicable. It is for fame and, more significantly, fortune that Jess (taking on the stage name, Jess Robin) pursues a career in the realm of popular music; the synagogue is quite poor and cannot pay its Cantors much money. His father allows his son to venture to Los Angeles to pursue a recording contract, and continues to keep in close contact with Jess throughout his stay on the West Coast. His father even travels to the West Coast for a visit, and it is only upon meeting Jess' new love interest, shiksa Molly, that his father denounces his son. It is this scene that has drawn the ire of most critics, for Laurence Olivier, as Jess' father, tears a piece of his clothing, declares, in Yiddish, that he has no son (in a very exaggerated accent), and runs down the stairs screaming. Though the acting is quite bad in this scene, it is important to note that Jess, when asked by Molly what has happened, replies, “He said he has no son. He tears a piece of clothing as a sign that his son is dead." Jess, after translating his father's words, then tells Molly the symbolic meaning and the tradition in which this act occurs. The specificity involved in this explanation of tradition is absent, for the most part, in the original version, and its presence in the 1980 version is significant in that audiences, along with Molly, are given a context for a particular Jewish act. This moment still falls under the guise of “symbolic ethnicity" because its presence in the film is contextualized in the language of dominant discourse, which lies outside the Jewish American community. This moment marks the first time Jess' life is seriously and dramatically impacted by his Jewish heritage. Unlike Jakie, Jess turns inward, leaving the West Coast, his burgeoning career as a singer, and his shiksa behind to deal with the loss of his father and the problematic position of his Jewish identity. After all, Jess' father is emblematic of both his family and his heritage, and his denial causes Jess to enter an “identity crisis." The scenes of Jess' introspective journey are relayed through a multitude of “hitchhiking shots" in which the protagonist travels across America , and the guitar case he carries signifies his status as a “traveling musician." Though admittedly melodramatic in presentation, these scenes serve as a metaphor for contemplation and search for a way to combine his Jewish and American identities. What brings Jess back to the West Coast is news that he has a son – named, ironically, Charlie Parker Rabinowitch (this name connects the film back to its title). The third-generation has thus been introduced and serves as a means of resolution for both the protagonist's father and Jess' identity. Jess travels to New York and, reminiscent of the original, is called upon by a friend of his father's to sing “Kol Nidre." His father has taken ill and is unable to sing the song. An interesting departure from the original occurs when Molly tells Jess to sing the song in her father's place. She remarks, “I may not be Jewish, but I do know how important the first night of Yom Kippur is! That is the holiest of days!" Thus, even though she is an outsider, Molly does have a superficial knowledge of the major moments in the Jewish tradition. Her acknowledgement of the two sides of Jess – a second-generation Jewish American and as an American popular entertainment – facilitates the sense that this is a film about identities. Interestingly, part of this understanding may be due to Molly's own position as a second-generation child of immigrants. Her father, an immigrant from Poland , changed the family name in order to assimilate into the American social fabric. The audience is given this piece of information early on in the film, yet there is not another mention of her heritage and her ethnic background for the rest of the picture. Yet its mention does bear consideration; this is a film of immigrants, and it examines immigrant history. Though the focus of the 1980 version revolves around Jess' immigrant past, the inclusion of other immigrant pasts in both the song “ America " and within the framework of shots in the film expands the scope of the narrative. In line with the ethnic revival, immigrant pasts are considered, and the implications of these pasts are addressed through the characterizations of the supporting actors and in the use of “ethnic" extras in the film's background shots. Upon singing the “Kol Nidre," Jess is reunited with his father, and the reconciliation that occurs is solidified by his father's appearance in the audience during the final scene of the film. Unlike the audience presented in the original Jazz Singer , this audience is multicultural in make-up, ethnically diverse, and they all participate in Jess' singing of “ America ." Jess is dressed in a blue shirt, and his scarf, which resembles a Jewish prayer shawl, is red and white. The stage lighting is red, white, and blue, and the protagonist's final pose, one arm triumphantly raised, his other hand on the microphone, is reminiscent, as Rogin asserts in Blackface, White Noise , of the Statue of Liberty. This final shot connects to the opening shot of the Statue of Liberty, signifying that the protagonist has come “full circle." The choice of the final song, along with Jess' dress and stage demeanor, celebrate his immigrant heritage and his position as an American. The Statue of Liberty, a symbolic and actual site of entry for thousands of immigrants, is quoted to further emphasize this new “American-ness," in which immigrant past and American status can exist, side by side, in the cultural imaginary. Thus, the 1980 version of The Jazz Singer , though certainly flawed, addresses the position of immigrant groups at a particular moment in history. The inclusion of Asians in the opening scene, for example, can be considered as a result of both the 1965 Immigration and Nationality Act and the 1980 Refugee Act. And, as David Kehr asserts, the film is a narrative of identity conflict and resolution, and this resolution is multicultural in scope. The assimilationist identity construction presented in the original Jazz Singer has given way to a 1980 Jazz Singer multicultural space in which multiple identities can exist. Though a badly acted film, Neil Diamond's version of The Jazz Singer is a still a significant cultural product and deserves to be considered along with other immigrant narratives. From guest contributor Cathy J. Schlund-Vials, program curator for the New WORLD Theater.